NOTE: This content is old - Published: Friday, Nov 23rd, 2018. Welsh Government Education Secretary Kirsty Williams has heard how Wrexham Glyndŵr University is working with communities to drive improvements across its region. During a visit to the university’s Plas Coch campus, Ms Williams met with four different groups about their work with people across North Wales and beyond. These included staff, students and partners on two new programmes covering public services leadership and social prescribing, as well as teams who cover community volunteering and mental health work. The session took place in the University’s new state of the art learning space, which is equipped with a range of high-end IT infrastructure and technology. The space was designed as a Student Centred Active Learning Environment (or SCALE-UP) classroom, where academics interact with students in small groups and technology is used to enhance learning, and the Minister’s visit followed the same format – giving her the chance to take part in a range of one-on-one round-table discussions with the diverse range of people working with Glyndŵr in communities across North Wales. 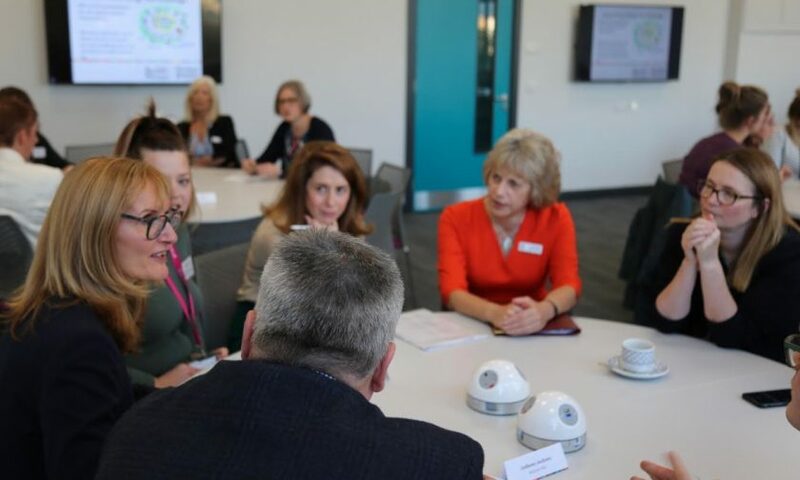 Wrexham Glyndŵr University Vice Chancellor Maria Hinfelaar said: “It was good to catch up with the Minister and to set out some of the ways we are collaborating with people across the region. “Some of these involve relatively new ideas – for instance, the idea of social prescribing, which is essentially where people’s wellbeing is boosted by linking them to relevant services in the community and reducing dependency on medical interventions. “Helping link those people to services means truly listening to them – something the Minister herself picked up on and related back to her surgeries in Powys during our discussions. It is also the model we follow in our communities. Education Secretary Kirsty Williams said: “I am pleased to have the opportunity to visit Wrexham Glyndŵr University to see the good work being carried out, connecting campus with community. “It is essential that Welsh Universities don’t see Civic Mission work as an extra activity in addition to current workload, rather as an integral part of academic work that both informs and is informed by teaching and research. “Partnership working between the government, institutions, and the academic community is essential if we are to address our great societal and civic challenges. Universities should be accessible and relevant to their local communities, whilst also being open to students, scholars, and intellectual developments from around the world. We have a proud tradition of this kind of civic engagement, and I’m delighted to see new ways of taking this work forward.